The Best fishing tackle box is an essential piece of equipment for any angler. While it doesn't necessarily affect your casting or retrieval technique, it will directly affect the options available for you, especially in regards to lure selection. 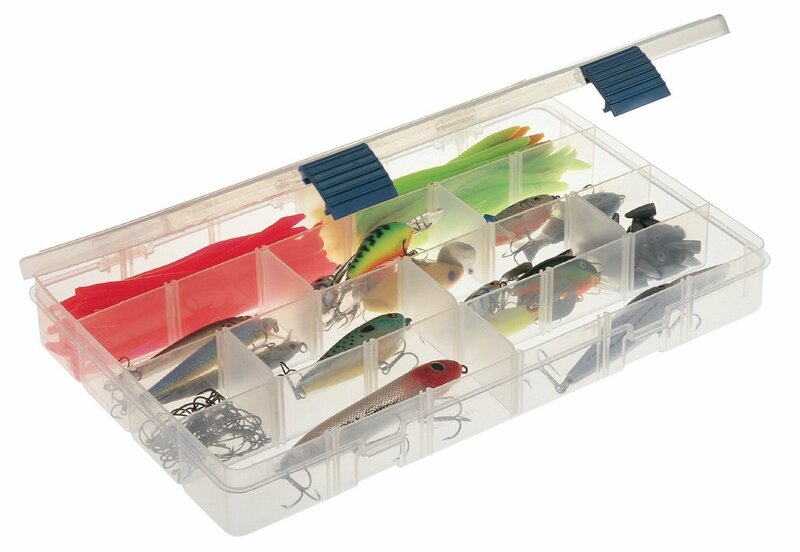 We could also go on about how a properly organized tackle box will save you time between casts, ultimately allowing you to maximize the time you have a lure in the water, but in our opinion, the main benefit of having a best fishing tackle box is peace of mind. Having a fully stocked tackle box is great, but regardless of what you have in it, we find that knowing where all your gear is and that you have enough of it simply decreases stress and allows you to relax a bit more while you cast. There are lots of different types of tackle boxes available, all in different styles and sizes. The main thing is that you have one (any box will do), as that's more than half the battle. However, if you really want to optimize your tackle box based on storage requirements, size, weight, and design, you will likely be very pleased you took the extra step. 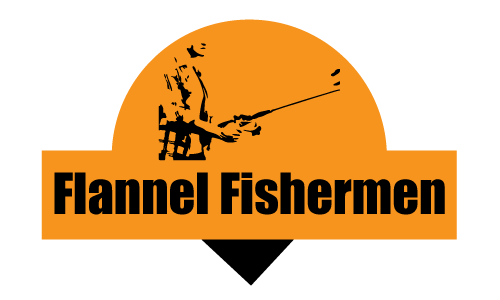 Therefore, flannel fishermen and his team meant to provide you with an overview of the different types of tackle boxes available, when they are or are not appropriate, and what our personal favorites are and why. This is your basic tackle box that serves its purpose without any fancy perks. It comes with 4 permanent rows as well as 24 dividers to further optimize your storage, which is the reason they state "4-24 compartments". This tackle box isn't waterproof, and the material is a standard plastic you would expect on these types of storage items. It's durable when handled with care, but over time little bumps and scratches will add up, and it will likely break sooner than some higher-end models. The latches do a good job keeping the box closed, but over time they will snap as well. The dimensions of this Plano tackle box are 14 x 9.13 x 2 inches, which makes it one of the smaller tackle boxes that you can get. This can be a good or bad thing depending on your preferences. If you don't have much gear, or you just want to pack the essentials for a couple hours on the water, this is a great little box. If you're planning to be out on the water the whole day, are going on a trip, or would like to have lots of equipment with you just in case, then it might be a bit too small. Overall, for the price, this is a nice small tackle box that does it's job well. The adjustability is a bonus for the price, and Plano is a reliable company with good customer service, so you should be in good hands if anything appears to be faulty. We recommend this tackle box for those anglers who are looking for smaller storage, some spare boxes, or just something really cheap. The Plano 1364 4-By Rack System tackle box is a step up from the basic 2-3700 Plano tackle box that we reviewed, primarily in terms of storage capacity. As you can tell from the picture, the box is bigger overall and contains many different storage compartments. The dimensions of this tackle box are 13.375 x 10 x 14 inches, and it includes 4 2-3650 Plano utility boxes that are interchangeable with any Plano 3600 series utility boxes. Additionally, there is extra storage under the lid for much larger items or any overflow from the boxes. The construction of this tackle box is pretty nice, as the whole thing is a hard sturdy plastic with a DuraView front cover. The 4 trays are great, but just be aware the adjustability is limited. You have some tabs that you can remove and insert, but there are a couple in each tray that are permanent. 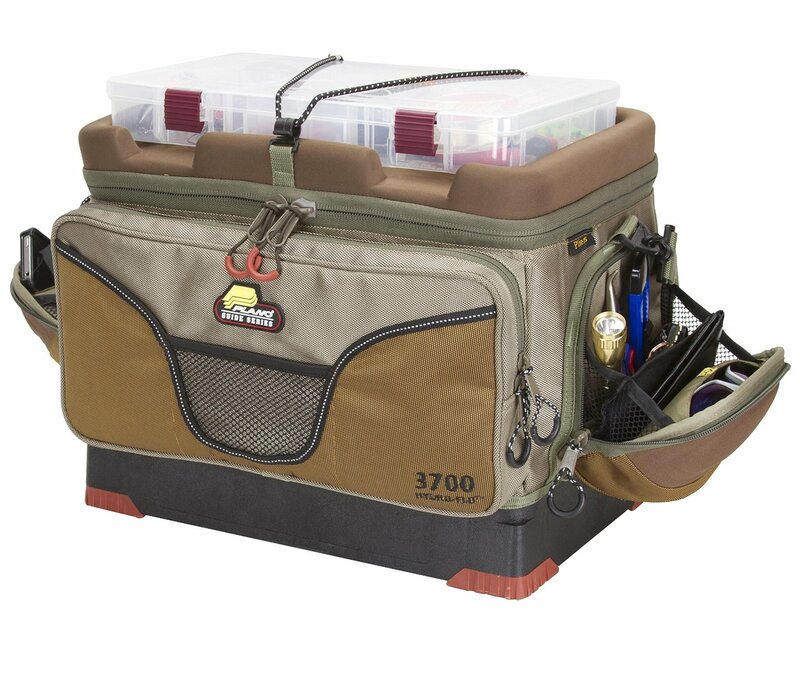 Overall, this is a great value tackle box that offers tons of storage without breaking the bank. The sturdy plastic makes it easy to clean and difficult to break, the semi-adjustable trays allow for some customization, and the extra storage under the lid is great for those bulkier items. 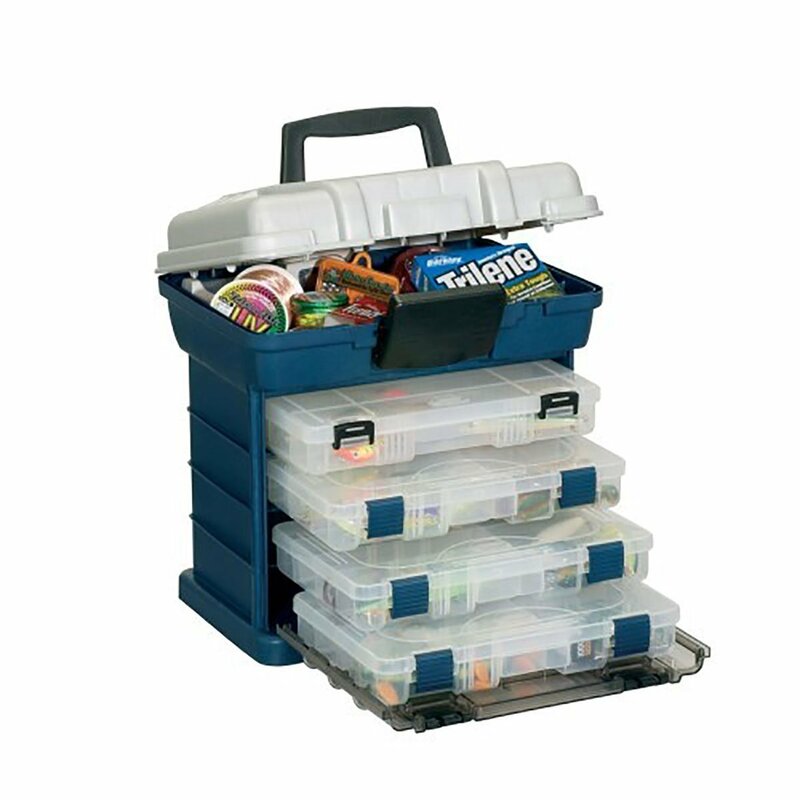 We recommend this tackle box for any angler on a budget who is looking for lots of storage. This tackle box is where you start leaving the cheaper standard tackle boxes and start to enter the high quality range. The Flambeau T5 tackle box provides great value for something this nice, so even though it's a little more expensive, it's definitely worth the consideration if you're looking for a solid tackle box. The T5 has 7 quick-access storage compartments under the lid as well as compartments for spinnerbait storage. If you're carrying liquid-filled bait containers and are worried about them leaking inside the tackle box, the T5 helps address that by implementing open storage containers. As for the front-loading containers, it comes with 4006 (x2) and 2003 (x1) tuff 'Tainers (brand-specific), and 00220 (x1) spinner box. So while many popular utility boxes may not fit well in this system, you can get these separately through the company, so if one goes you can probably avoid replacing the whole thing. 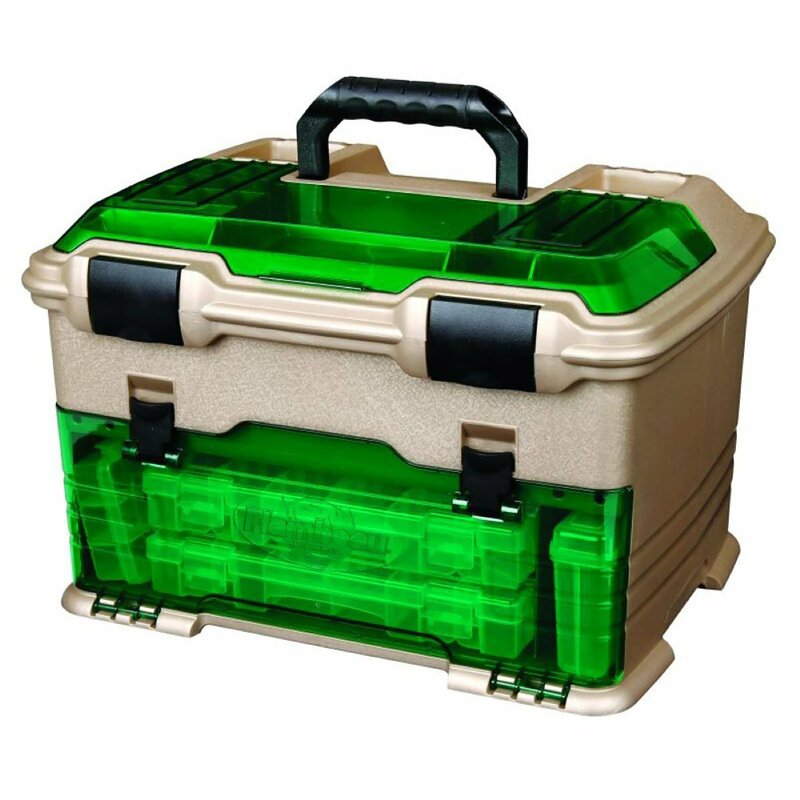 Overall, this is an excellent tackle box, and although it's not extremely popular, it's very well-liked by the majority of customers who use it. It looks flashy, has the design that all of us know and love (* the design is similar to a tackle box I had growing up, so I'm bias), and is known to be sturdy and durable. The downside is it's a noticeable step up in price as well. Therefore, we recommend this tackle box to more serious anglers, or at least those that will get enough use out of it to justify the price. It can also make for a great gift, as it's nothing too out of the ordinary, just great overall quality. Molded top with elastic tie-down for 3700 series StowAway utility box. Two padded pockets for non-bait items like sunglasses. This is what we would consider to be a fancy tackle box. It has some great storage capabilities and other qualities, but it comes in at a steeper price than the majority of tackle boxes. This is basically a soft bag with a shoulder strap that holds the standard tackle box containers inside the covering. The shoulder strap is convenient and makes it similar to carrying a small over-the-shoulder cooler, although it would have also been nice if it included a handle so you didn't have to use the strap. However, we understand this would have been difficult to incorporate given the upper easy-access storage. Regarding storage, there's lots of it! The 3700 series containers provide ample room to store your lures and tools, and the adjustable dividers help you optimize your storage. If you're efficient with the dividers, you may be able to store all your fishing gear, plus some extras like food! The waterproof base is a bonus, and the pockets are nice to have as well. The main downside to having a soft shell like this is cleaning, as we prefer something like hard plastic so we can easily hose down the tackle box every so often, but that's just personal preference. Overall this is an excellent tackle box with a unique design. Aside from the main complaint of it being expensive, any other issues we have with this are picky, and were determined by actively trying to think of things we don't like about it. Therefore, we would recommend this tackle box to anyone who wants a waterproof base, an over-the-shoulder style carrying strap, and convenient storage of both fishing gear and personal valuables. If you're looking to save some money, you may want to consider something cheaper. If you're looking to buy this as a gift, just be fairly certain that you know the person you are buying for will like the shoulder strap design, otherwise you can't really go wrong. There's no exact formula for choosing the proper tackle box. The key factor is thinking ahead of what you will be putting in it. This seems pretty obvious, but it's easy to get swayed by extra features that you may never end up using. Therefore, try and stay focused on the most important aspects to you, which are likely storage volume, adjustability, and durability, but maybe you have some other strong personal preferences as well. There isn't too much earth-shattering knowledge we can drop about tackle box size. Simply put, if you plan on taking a lot of gear with you, then you'll need a larger tackle box. If you're trying to cut down on the amount of stuff you're bringing, it could be worth considering a larger tackle box for home storage, and keeping the necessities in a smaller box for easy transportation to the water. 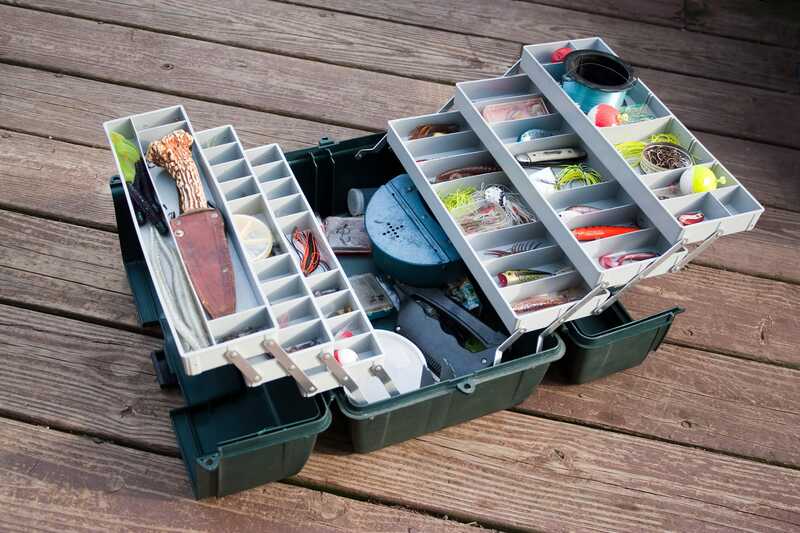 Many tackle boxes include numerous smaller boxes, or utility containers. These are the simple clear plastic containers with removable dividers that you have likely seen a lot of. Given these serve as excellent storage options for lots of people, not just fishermen, companies have now begun to standardize the dimensions so that these boxes can be easily replaced or interchanged. Therefore, it's usually worth keeping an eye on the brand and model numbers. For example, Plano is a very popular brand that carry some of the most popular tackle box utility containers. If you already have a smaller plastic box that you use, there's a good chance you can find a larger tackle box that will accommodate your smaller utility box, which will leave you with a spare or extra storage. For example, the mid-range Plano tackle box that we reviewed above comes with four 2-3650 utility boxes, but they are interchangeable with any Plano 3600 utility boxes. If you already have any of these, it could be worth a more serious consideration, or even just knowing that's an option in the future could help, too. Regarding durability, you will likely have to depend more on reviews for this aspect than others. The more popular tackle boxes will all have sufficient reviews, but there are also a few things you can look for in the tackle box design to help you gain a sense of the potential durability. In terms of material, thin cheap plastic is usually the worst you will see, and even this holds up fine considering the cost. Thicker opaque plastic is usually preferred, but this may be heavier or more expensive as well. However, where you really want to focus your attention is the moving parts or areas of concentrated stress. This is a fancy way of saying look at the things that usually break first. Latches are often the first to go. If you using a very basic tackle box where the latches are the exact same plastic material as the rest of the box, and they are actually the exact same piece of the plastic as the rest of the tackle box but just weaker at the pivot point to allow bending, these will likely break before other latches. Latches that are separate altogether may seem like they have a higher chance of breaking because there could be additional moving components, they are actually put in place to increase durability, so we usually like to see those. We would also suggest looking at the handle and/or strap. If the handle is thin and installed using only plastic, this may be less likely to stand up to the test of time. If it's fairly thick and any moving parts are initiated by strong metal screws or other sturdy components, you will have abetter chance of seeing the box hold up over time. Like any other product tackle boxes can highlight features that sound great in order to entice you to buy them, but sometimes these features just aren't worth it. In our experience, we have found this is usually the case, but not always. One extra feature that we do really like is open storage for liquid-filled bait containers. Keeping bait liquid out of the box is always nice, as you don't want to deal with any potential leaks and mess on the inside. But why we really like these containers is you can easily interchange "open-storage" with "cupholder" and replace "liquid-filled bait containers" with "beer", and you have instantly improved your day by a substantial factor. Some other extra features you may see more often include spinnerbait hooks, line dispensers, and secure locks. In our opinion, we don't find too much extra benefit in these. For the hooks, it can take a bit more discipline than we have to constantly use them, and things can get a little mixed around in transport anyway. The line dispensers can be handy, but often times these will just end up being holes int he tackle box located close to a compartment that's good for storing line (could be a DIY project). Lastly, many tackle boxes come with locks, which sounds great, but most are flimsy or simply secured by plastic, so if you really want in, you can get in. Consider these to be more secure latches for transport as opposed to burglary protection.